iRig Voice is a fun and colorful handheld vocal microphone that's optimized to deliver stunning audio quality. It's the perfect companion for all your favorite karaoke and music creation apps — simply plug it in to your device and start singing. iRig Voice features an ergonomic design for hours of comfortable handheld performance, and its shape fits easily into most standard microphone stand clips for stage use. iRig Voice is optimized for vocal frequency range reproduction, it utilizes a compact cardioid pattern for close voice pickup which minimizes feedback when used with speaker systems. It has an on/off slide switch for quick muting of unwanted sound and an oversized strain relief cable end for durable, consistent performance even during high-energy performances. iRig Voice comes in 5 stylish colors: Green, Blue, Yellow, Pink and White adding a bright new level of style to any performance. The casing is formed from a strong and durable, yet lightweight, pigmented thermoplastic that wont fade over time. A lightweight durable aluminum mesh cage completely encloses the mic capsule for protection from drops, and a breathable moisture barrier keeps vapor out of the capsule for flawless performance every time. 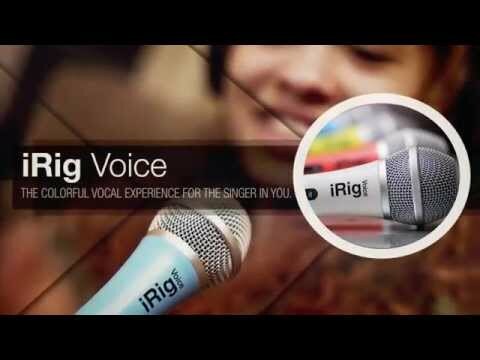 With iRig Voice, you can be a star thanks to its durable construction, intuitive apps and universal compatibility. iRig Voice is also perfect for capturing broadcast interviews in the field, conference calls, school projects, parties or anywhere vocals need to be captured. And iRig Voice works right out of the box — no additional programs or apps are required to use iRig Voice making it a truly plug-and-play accessory.